I titled this picture with the simple "Railroad" because it actually incorporates two different train attractions. 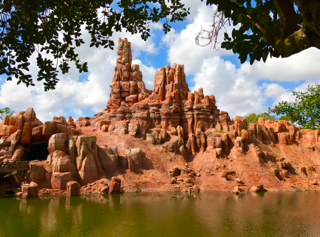 First, I was actually riding Big Thunder Mountain Railroad today, when I took this shot. 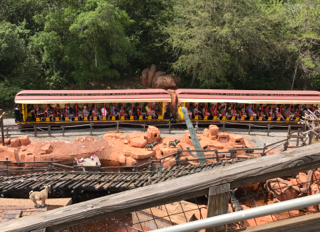 However, the two passenger cars in the photo are part of the Walt Disney World Railroad, that had just left Frontierland Station. With the major Star Wars construction taking place at Hollywood Studios, Muppet*Vision 3D is the last attraction still standing in the area of the old Streets of America. However, like the Muppets themselves, this show is still popular, and thousands of guests enjoy it every day. I was waiting for my tour guests today, and was browsing the "posters" near the exit. 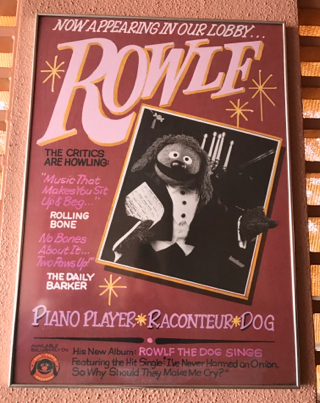 I particularly like this Rowlf one, as it has a small hidden Mickey in the bottom left corner, formed by the dog's nose and eyes. 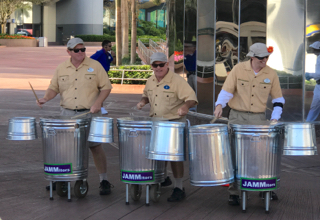 The Jammitors have been entertaining Epcot guests for years, with their creative percussion show utilizing trash cans and other custodial tools. However, during the Flower and Garden Festival, this trio becomes the "Jammin' Gardeners." The new Epcot opening procedure has the group warming up the crowd just before rope drop. I took this shot a few days ago. Epcot is a place that has seen some new character meet-and-greets over the past few years. They can be found in the Epcot Character Spot in Innoventions West. First came Baymax, who originally debuted at Hollywood Studios. Then, Joy and Sadness arrived, from the movie Inside Out. 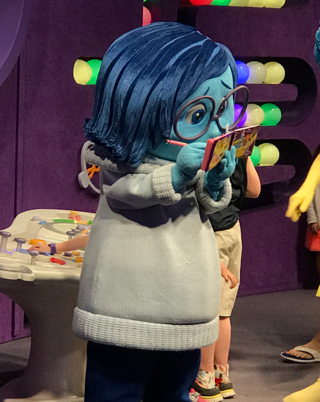 I took this shot of Sadness last week. 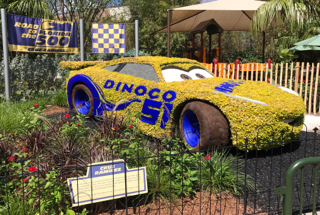 This year's Flower and Garden Festival at Epcot features a new topiary from the Cars universe. Cruz Ramirez can be found along side Lightning McQueen, not far from the Test Track area. Cruz is one of the stars of the newest Cars movie that will be in theaters in June. 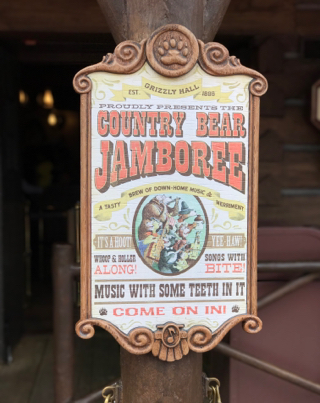 The Country Bear Jamboree is a classic attraction that has been at Magic Kingdom since opening day. As one of only three attractions that were unique to Walt Disney World (compared to Disneyland) in 1971, this is truly a classic. My favorite character from the show has always been Big Al, who was voiced by Tex Ritter. I took this shot yesterday, while my tour guests were enjoying the show. I don't normally post food photos, but this food has a theme. The Backlot Express at Hollywood Studios is not far from Star Tours, and some of the meals now have Star Wars names. 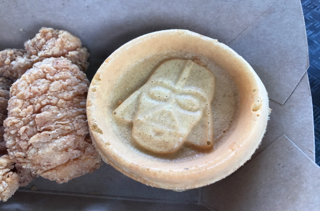 I enjoyed the Dark Side Chicken and Waffles for lunch a few days ago. 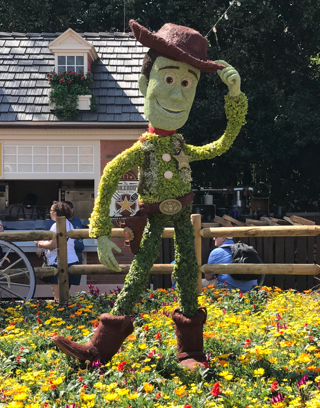 The majority of the Flower and Garden Festival topiaries around World Showcase are Disney characters. However, there are some unique ones, like this dragon in China. I took this shot on a picturesque day last week. The Pirate's Adventure is a fun "treasure hunt" game that takes place in Adventureland. Guests can follow five different maps to locate interactive displays that are activated by their Magic Bands or park tickets. 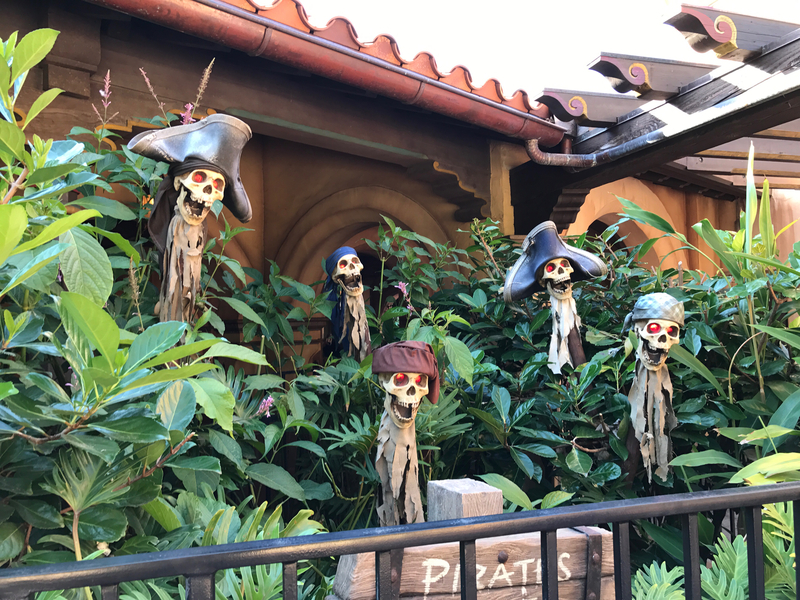 I took this shot of some talking pirate skulls while touring with some fun guests yesterday. The Seas with Nemo and Friends is a fun little ride that takes guests into the 2nd largest aquarium in the country. 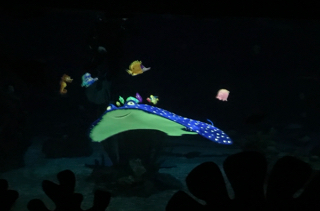 Toward the end of the attraction, there are animated characters from the movie mixed in with the actual marine life. Here is a shot of Mr. Ray and his students. When you enter the Magic Kingdom, it feels like you have stepped back in time to the beginning of the 20th century. Everything from the music, the vehicles, and the cast member costumes brings you right into the early 1900s. One of my favorite tidbits to be found here is this "real" mailbox. 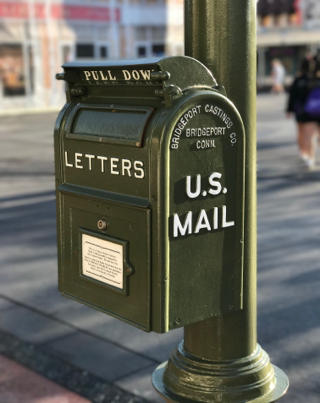 It is a place where you can actually mail a letter from the Magic Kingdom. I also like that the manufacturer is from my home state of CT.
Rock 'n' Roller Coaster is a favorite attraction for many Walt Disney World guests. The ride itself is unique and thrilling, and it would be a great coaster even without the added touch of the music. However, Disney never fails to impress when it comes to the details. 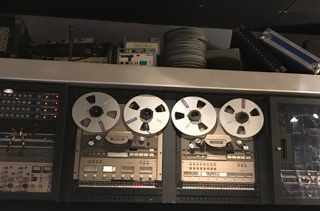 The "recording studio" theme is prevalent throughout the experience, as can be seen here in this photo I took in the gift shop today. The Plaza Gardens are the relatively new areas between the end of Main Street and the Hub in the Magic Kingdom. It is a place where guests can relax, fireworks can be watched, and even wedding vows can be exchanged. There are some unique "bushes" in the area. I took this shot in East Plaza Garden while giving a tour this morning. The Disney park icons are some of the most photographed structures in the world, and I certainly have taken my fair share of these shots. However, there can be very different photos of the same subject, depending on time of day, sunlight, etc. I took this shot tonight at dusk, after a fun dinner at Tusker House. Wilderness Lodge is one of my favorite resorts. It has a great theme, an amazing lobby, and some historic Disney memorabilia. 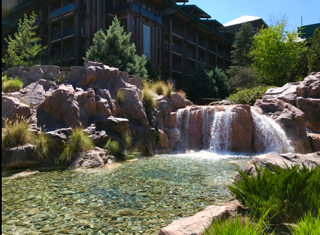 The grounds around the resort are also impressive. I took this shot of the waterfall a few days ago, while visiting with family. The Magic Kingdom opens early this week, due to the large spring break crowds. 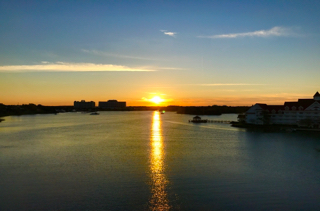 A few days ago, I was able to see the sun rise over the Seven Seas Lagoon while on the monorail. You can see The Contemporary in the distance and a little of The Grand Floridian in the foreground. Hollywood Studios continues to be a great place for Star Wars fans to visit. It is going to get even better when the new "Star Wars Land" opens in 2019. 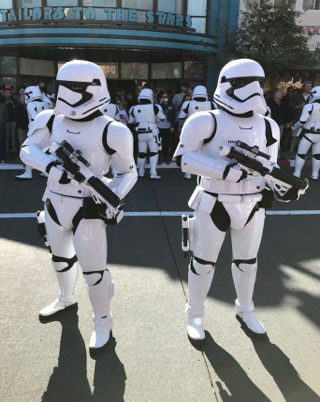 Today, I brought my tour guests to a great spot to enjoy the March of the First Order. The Stormtroopers stopped right in front of them, and were slightly intimidating to the kids. The Walt Disney World Railroad has been under refurbishment for several months, but finally returned to service a few days ago. 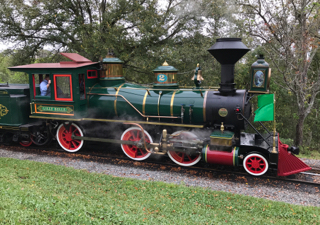 I was pleasantly surprised to see the Lilly Belle back on the tracks today. She was gone for many years to complete a major repair. 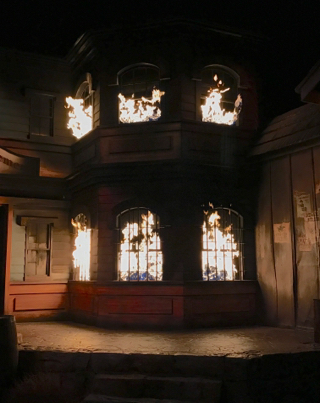 The Great Movie Ride is an iconic Disney attraction that has changed very little over the years. As much as I ride this attraction, I rarely see the live action western scene. Today, I was happily surprised to see that scenario play out while enjoying it with family. 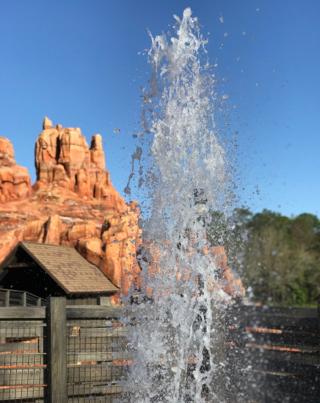 There are so many photo opportunities near Big Thunder Mountain Railroad. 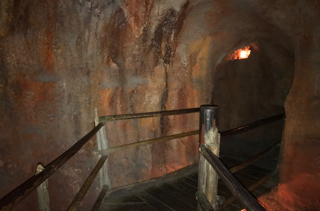 This geyser can be found near the exit of the attraction. I took this shot while giving a Magic Kingdom tour last week. Living with the Land is an original Epcot attraction that has been entertaining and educating guests for nearly 35 years. 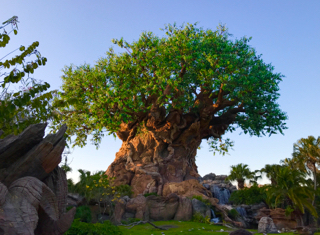 Although it originally had a different name and was narrated by a live cast member, it still has the same overall theme. 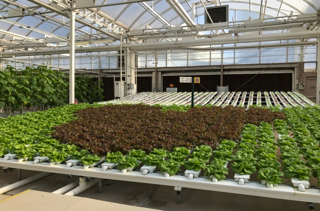 I took this shot of the "hidden Mickey" lettuce while enjoying the attraction yesterday. There are dozens of great topiaries on display for the Epcot Flower and Garden Festival this year. Woody has been a regular near the American Adventure for a while. I took this shot today while enjoying World Showcase with my family. 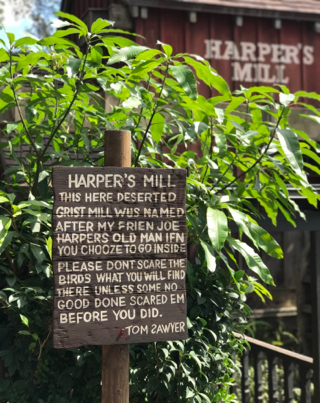 Harper's Mill can be found on Tom Sawyer Island. It was named after a character from The Adventures of Tom Sawyer. However, it is also a nod to one of Disney's first Imagineers, Harper Goff. 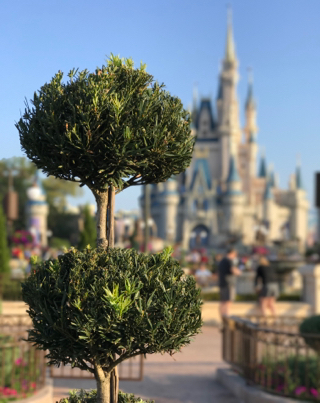 I took this shot in "portrait" mode while visiting Magic Kingdom last week. 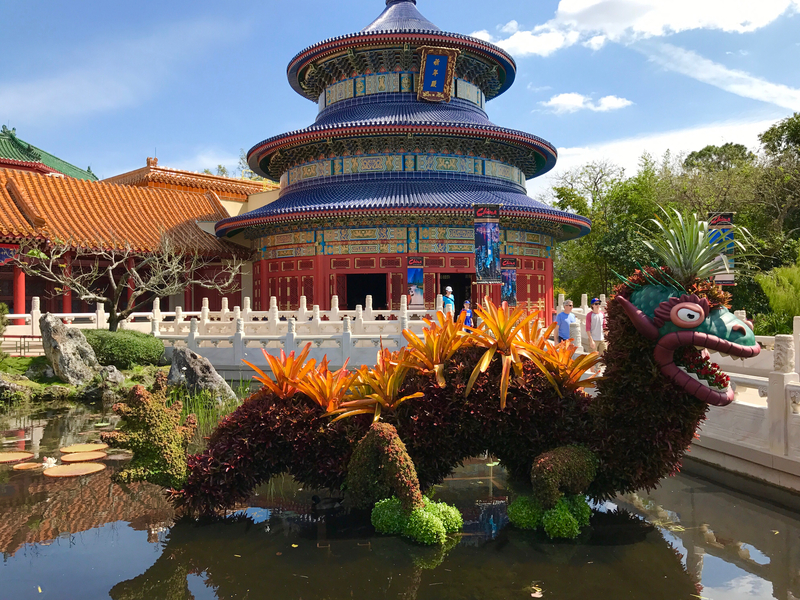 This year's Epcot International Flower and Garden Festival opened last week, and it is better than ever. There are more food kiosks, great concerts, and additional topiaries. One of the most impressive spots each year is this large grassy area that transforms into an incredible flower bed. This Mickey is on the outside of the Harambe Market in Animal Kingdom. 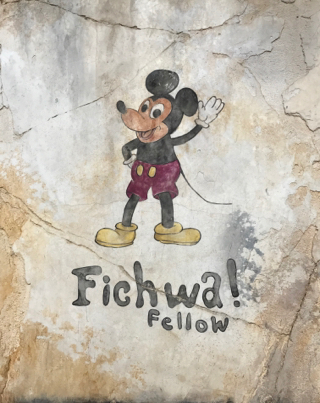 Since the word fichwa means "hidden" in Swahili, this is the most obvious hidden Mickey in that park. This is certainly not a difficult one to find, as it can be seen in plain sight. While giving a tour at Animal Kingdom today, I came across a crested coua. 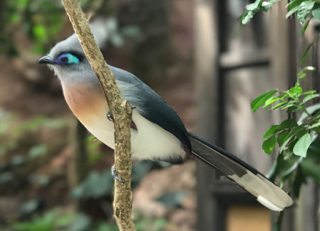 This bird is indigenous to Madagascar, but can be seen on the Gorilla Falls Exploration Trail. I used the "portrait" mode on the iPhone 7 Plus to snap this shot. 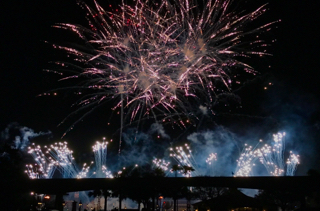 Illuminations is certainly one of the best fireworks shows in the country, and we caught the finale while walking thru Future World last night. We were not far from the "butterfly enclosure" that is set up for the Epcot Flower and Garden Festival. You can see the monorail track in the foreground. 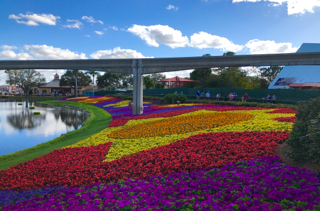 This year's Flower and Garden Festival is underway at Epcot. 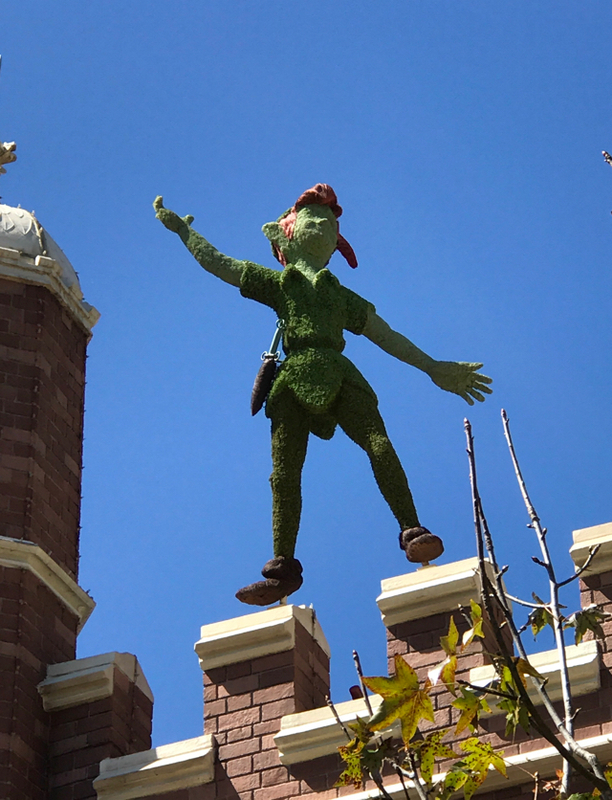 One of my favorite topiaries is Peter Pan, who sits high atop the United Kingdom pavilion. I took this shot while giving a tour yesterday. 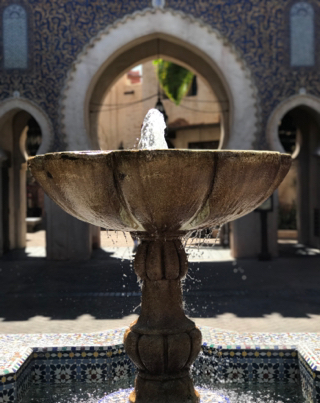 Morocco is one of the more unique pavilions at Epcot. It was the only one sponsored by the government of a country and not a private company. The king of Morocco sent his own craftsman to do much of the tile work. I took this shot of the fountain while giving an Epcot tour today. I have posted many photos of Big Thunder Mountain Railroad in the past. However, this view struck me as I was standing on Tom Sawyer Island a few days ago. It was almost as if the tree was creating a natural frame atop the mountain. You can see how the leaves on one branch perfectly outline the tallest peak. Tom Sawyer Island is one of the most overlooked gems at Magic Kingdom. Yesterday, I found myself in one of the caves without any other people around. So, it was time to take some flash photography in a normally dark location.